Whether you're a bride or a guest at a bridal shower you can't go wrong with this outfit. 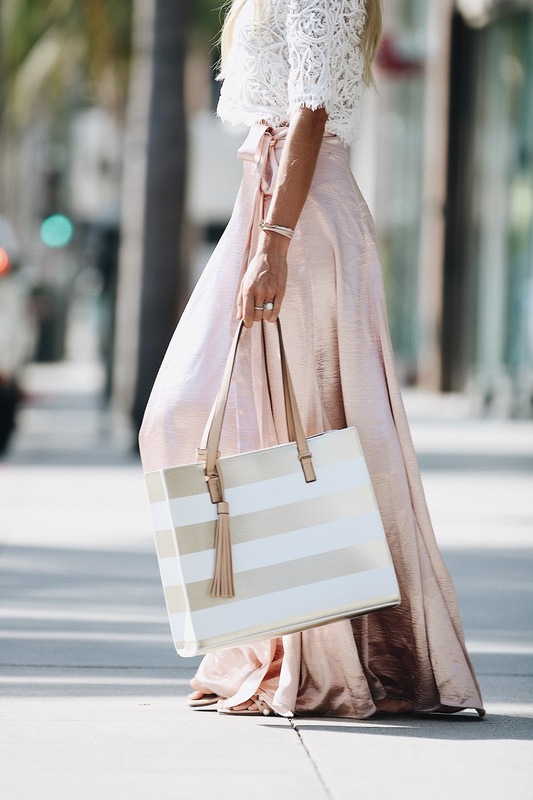 With summer being in full force we're all naturally switching to light color outfits, maxi skirts and flowy dresses. However, with summer also comes the wedding season, bridal showers and baby showers. So what is the nowaday wedding related festivities etiquette when it comes to picking an outfit? Is it OK to have a bit of white in your outfit or is it still disrespectful to the bride? I guess it all depends on the bride herself and you. Me being a number one fan of a good all white outfit it is extremely difficult to not wear a white top or a white flowy maxi skirt, I believe you should wear whatever it is you feel good in, however don't get me wrong there is limits for everything. If you're heading to a bridal shower, here is some helpful tips. Touch of white. It's ok to wear a tiny bit of white as long as it is not a majority of your outfit, crop top is OK as long as it is simple and doesn't look like a top of a wedding dress[no embroidered details, lace or rhinestones]. Crop top is a great way to have just a right amount of white. Pop of color. Ask the bride what are her main colors for the wedding and get a maxi skirt to go with your cute crop top! It will not only distract from the white but it will also show that you are there for her and you're involved in her wedding planning process + cute pictures that include all the fave colors of the bride. Thank you Madison West for partnering with me on this post. WEdding season is at its peak and this post really comes in handy rightnow! I think that this place is really suitable for any size of gathering. By the way, they offer a day care room with lots of toys for children. The food at wedding venues NYC is always delicious and the service is always great. Also the view is absolutely amazing.